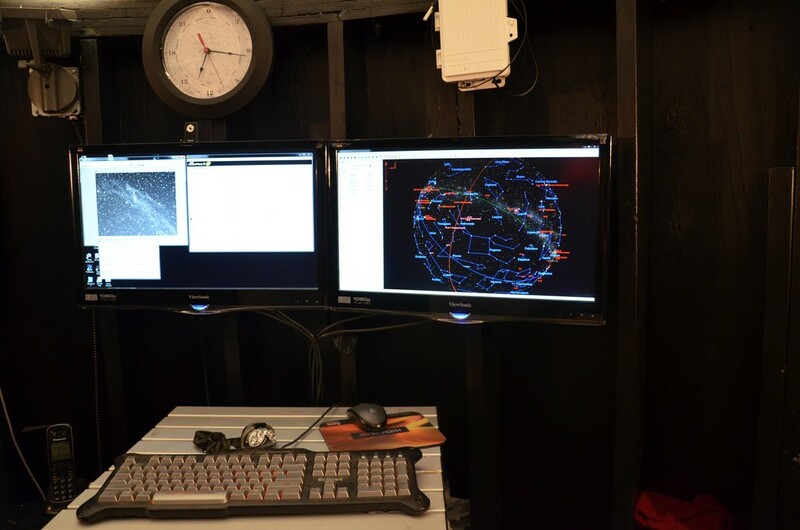 The observatory has a windows 7 class machine that is hardwired to many of the control systems in the observatory, including the Paramount, telescope and dome. The observatory computer is the primary machine that runs the imaging sessions and implements all of the automation. 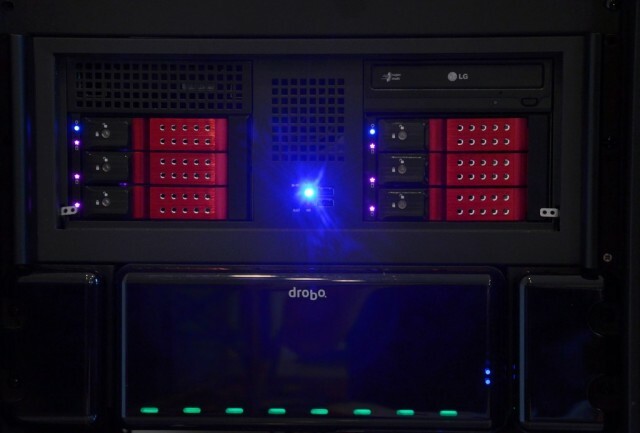 In addition to the observatory computer, there is a server that manages file storage and other functions. The server is configured in a RAID 6 array with 18 Tb of storage. The server is backed up with another 18 Tb of storage in a Drobo array. All images captured by the observatory computer are stored on the server for processing later. 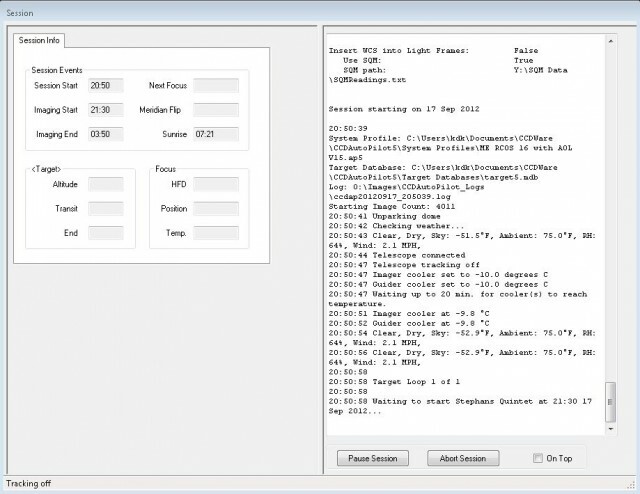 Finally, there is an environmental or weather server called DarkCloud that is directly tied to the weather station, sky quality meter, Boltwood cloud sensor and all sky camera. The weather server collects data from the various devices and uploads the data to the internet for display on the observatory web page. In addition, some of the weather data is made available to the observatory computer for monitoring during imaging sessions. For example, if rain or clouds are detected, that information is monitored by the observatory computer to either shut down or pause the imaging session based on the type of weather encroaching. Accurate time in the observatory is important for homing the telescope upon startup and other functions in the observatory. 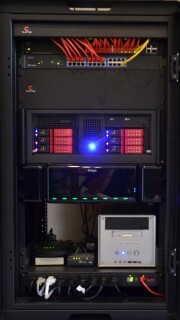 A time server clock is maintained to provide accurate time. The time is kept current by constant updating from time servers on the internet. A display for current sidereal, local and UTC time is maintained in the observatory. Power to the dome, telescope, Paramount ME, camera and other equipment in the observatory is controlled by web based power switches from APC (model APC7900). 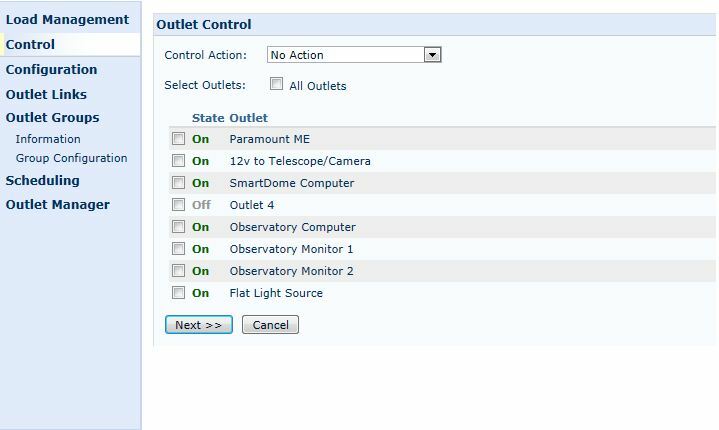 The APC web switches can be controlled manually through a browser based interface or automatically by running scripts sent to the switch. 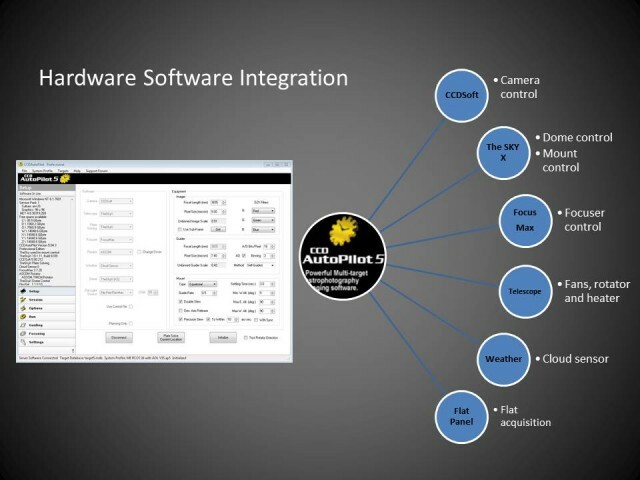 The autopilot observatory control software (discussed below) is configured to run scripts on the APC switches to automate powering on and off the equipment located in the dome. Back up power is also provided by a standby Kohler 18kw generator in case a power failure occurs. 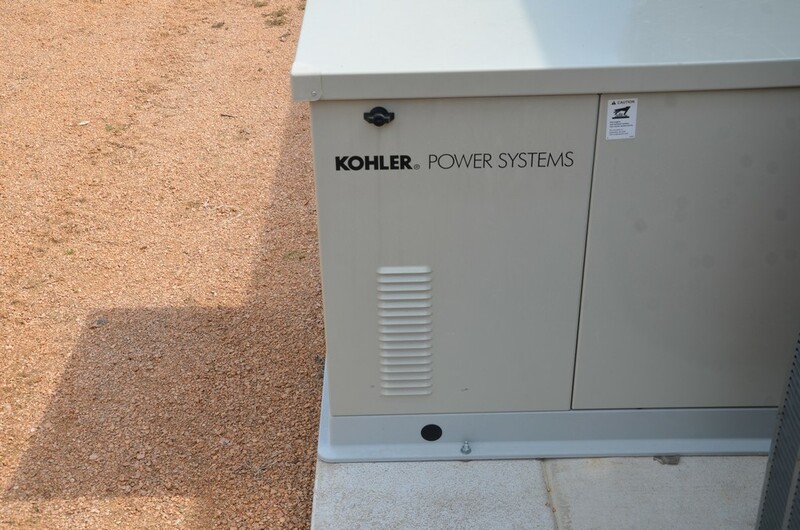 This ensures that the dome can be closed and other equipment safely parked during power failures. The dome is a difficult piece of hardware to automate. The dome has a lower drop out shutter and an upper shutter that opens by sliding back over the dome. To properly automate the opening and closing of the dome, the shutters must be synchronized so that that lower shutter closes before the upper shutter closes and opens after the upper shutter opens. Limit switches are implemented on the shutters to signal open and close and provide safety interlocks that make sure the shutters do not collide with one another. In addition, dome rotation also must be automated to rotate the shutter opening to line up with where the telescope is pointing. 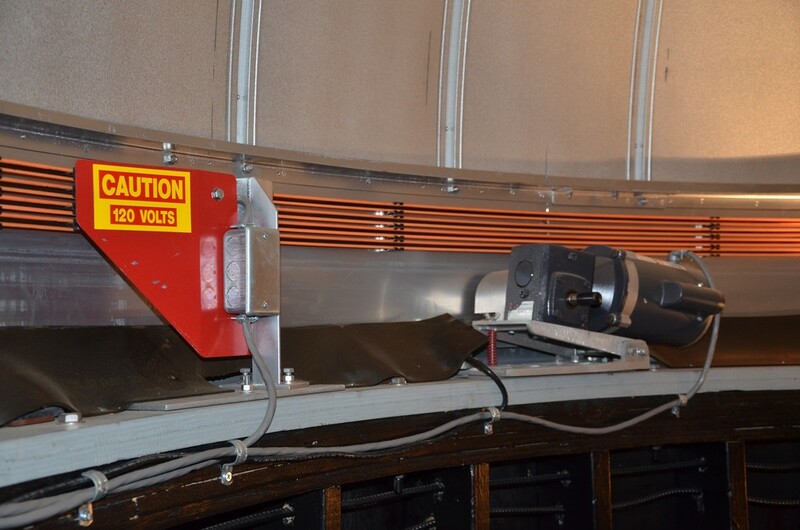 The dome has slip rings that provide alternating current to the upper rotating part of the dome. This power is used to run the shutter motors. Dome automation must also implement a way to provide control signals to the upper rotating part of the dome to actuate the shutter motors. Finally, the dome motors run on alternating current, and therefore, relays are needed to actuate the motors from a control interface. 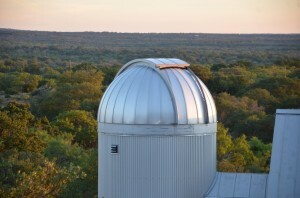 All of the dome movements must be orchestrated by the observatory computer to open the dome when night falls, close the dome when imaging is completed or rain is detected and synchronize the dome rotation with telescope slewing and tracking. A number of vendor solutions to dome automation were tried over a two year period. The only one that works reliably is the ACE SmartDome by Astronomical Consultants & Equipment. In fact, the SmartDome is a complete integrated dome automation solution that turns an Ash dome into a cybernetic dome with onboard intelligence. The heart of the Ace Smart Dome control system is a microprocessor running linux that interfaces with a series of relays and control systems that actuate the dome rotation and shutter motors. The microprocessor provides real-time status of the shutter positions and dome rotation. Electronic pushbuttons are available to manually operate the dome and they replace the manual drum switches that come with the Ash dome. The microprocessor completely synchronizes the upper and lower shutters so that one button control of opening and closing is implemented. The SmartDome control system is interfaced with a variable frequency drive that operates the azimuth motor. The variable frequency drive allows smoother starting and stopping of the motor by ramping its speed up and down. The rotational speed of the dome is also increased 1.5 to 2 times. The dome will typically beat the telescope to the final slew position. The ACE Smartdome has another control system mounted on the upper rotating part of the dome that interfaces with the dome shutters and limit switches. This control system is connected to the main control system with the linuc microprocessor through a direct radio link, and therefore, no sliding contacts or other means are needed to provide control signals to the rotating part of the dome, thereby increasing reliability immensely. This also means the dome shutters can be closed in any position without first having to park the dome over sliding contacts. The ACE SmartDome also has an integrated rain sensor mounted on the outside of the dome that will close the dome immediately without user supervision if rain is detected. There is also a hardwire input for signals from the Boltwood cloud sensor. These features allow the dome to automatically close without any user intervention when clouds are detected or if the sun is rising in the morning. The combination of a linux processor, imbedded firmware programming, cloud, rain and sunlight sensors and motor interface means the dome and the weather protection interlocks are entirely self contained. The dome truly has a mind of its own and can be relied upon to properly adapt to changing environmental conditions. Some images of the automation are shown below. 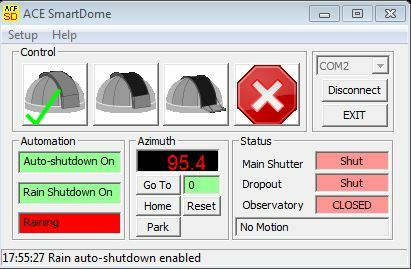 As to computer interface, the Ace Smart Dome control unit has a direct serial interface to the dome computer and ASCOM compliant software that allows all dome features to be controlled by the observatory computer. 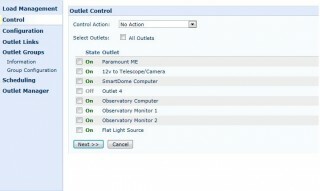 This allows the Sky X planetarium software to directly control the dome by talking to the ACE SmartDome microprocessor. Dome automation is seamless. Slewing the telescope from with the Sky X automatically causes the dome to slew with the telescope and stay synchronized. The Ace Smart Dome control unit also has its own software (ASCOM) interface for controlling the dome. The ASCOM interface also allows observatory automation software such as CCDAutopilot to directly communicate with the dome to make sure the dome tracks with the telescope during an automated imaging session and to close the dome when the session has ended. The system just works. The genius behind the SmartDome is Dr. Peter Mack from Astronomical Consultants & Equipment. 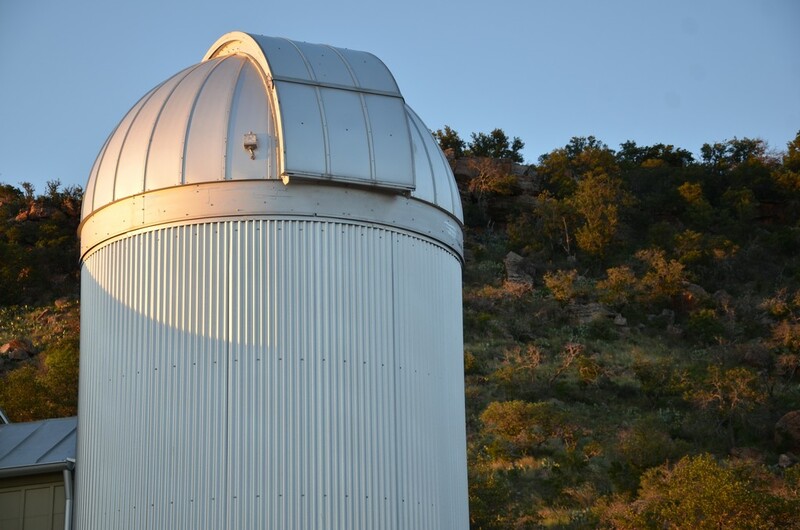 Dr. Mack is a professional astronomer and understands modern observatory automation needs. He personally installed the ACE SmartDome at the observatory. 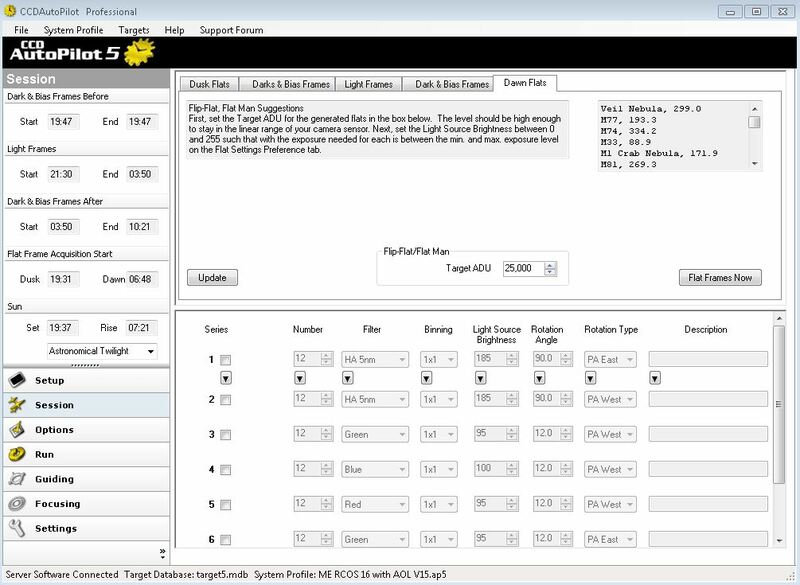 The first step in preparing for an imaging session is to select the image and define its coordinates, rotation angle, and the type of light frames to image.Autopilot has a unique adaptive autoguiding feature. 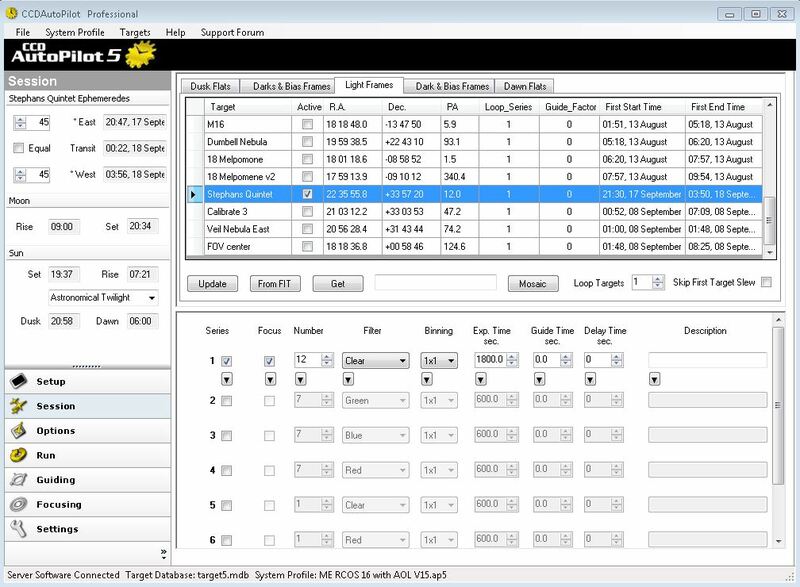 Once the system has been initialized and the guiding parameters set, automated autoguiding can occur at any location in the sky without any further user intervention. In the observatory, Autopilot has been accurately guiding for months without any further calibration or initialization. AutoPilot allows the user to set up a number of autoguiding parameters. The system also incorporates features to recover a lost guide star and to automatically set the exposure for the guide star, all without user intervention. After the light frames have been taken, Autopilot can automatically take flat frames through the various filters and at different rotation angles. Autopilot will first close the dome and park the telescope pointing to the flatman electroluminescent panel. The flatman panel is then energized at the correct brightness level for the various filters and a series of flats are taken for each filter and at a particular rotation angle. 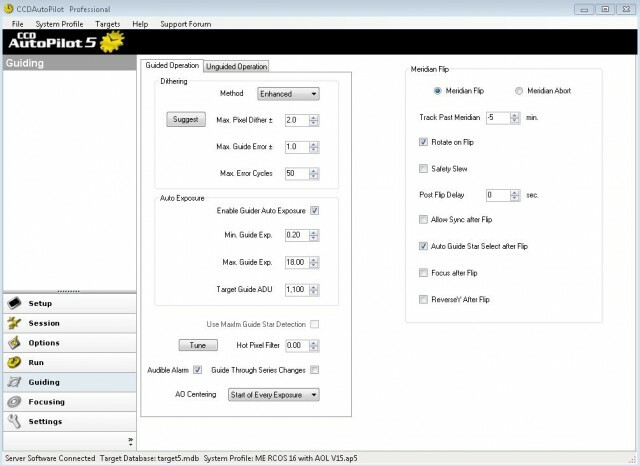 When Autopilot is running a session, it provides a comprehension log of events as they occur. Session information can even be emailed or texted to update the user. After an imaging session is completed. Autopilot will assess each image based on a number of parameters and discard those images that do not meet certain minimum requirement, such as FWHM. The qualifying images are stored on the file server for processing later. 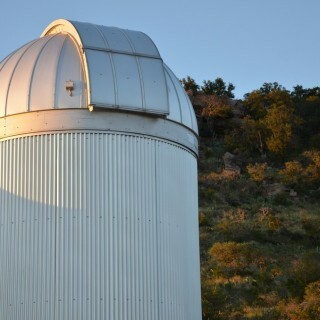 The video below shows a typical start-up sequence for the telescope. The telescope begins in its park position. The first sequence is the opening of the dome. While the dome is opening, the telescope is activated and sent to its home position where it begins tracking. 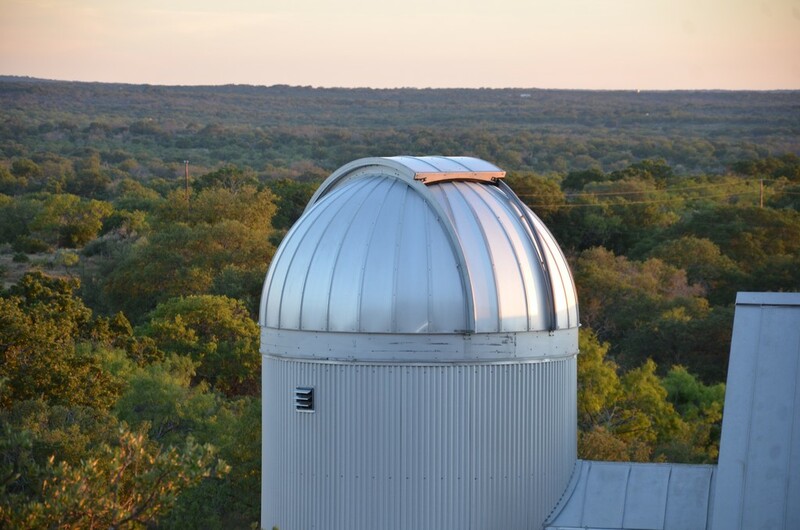 While the telescope is homing, the dome is rotated so that the dome opening is facing the prevailing winds to assist in cooling the dome. Can’t play the video? Download and watch on your computer.